The Enterprise Dashboard has been updated to allow for a much more flexible structure of both company hierarchy and the hierarchy of each individual project. It is now possible to create Groups that can include several Group Managers and Project Managers. This article serves to give you an overview how to easily create and edit Groups in the HoloBuilder Dashboard. If you have never used the Enterprise Dashboard before you should start with How to set up the Enterprise Dashboard. When you are unsure about the access rights for users also refer to how permissions work in the Enterprise Dashboard. All existing groups are shown, you can choose between two different views. 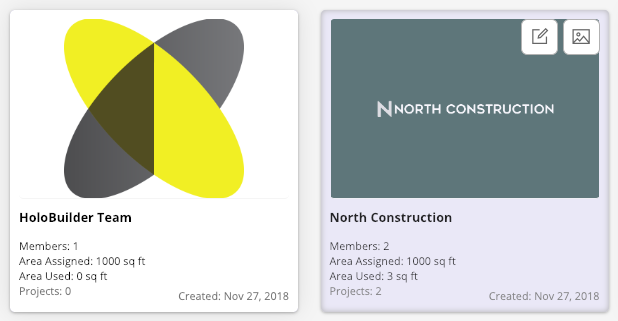 Displays your groups as tiles including a larger Group image as well as the group name, client name, project area (both assigned and used), and the date when it was last edited. This view helps you scan your groups faster according to the project image. 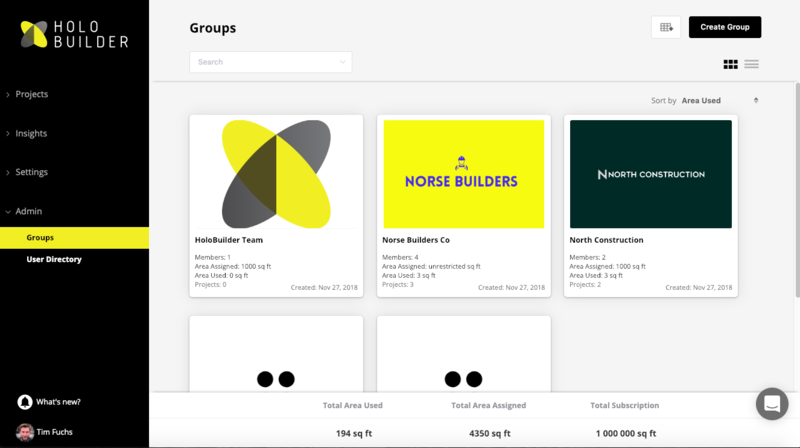 Displays your groups in a list including the same information on the project as the tiles view. The list view helps to get a better overview, especially when looking for a specific project by name. Two create a new group press the button 'Create Group' in the upper right corner. A dialog will open where you can enter the necessary information to form a new group. You need to enter a name for the Group and select at least one Group Manager. The Group also needs to be assigned an available area in square feet. This can also be set to unrestricted, in which case the maximum amount is that of the Enterprise Plan. A group image can be added, but is not necessary. The group image and all other details can be changed later on. There are two ways to edit existing groups. 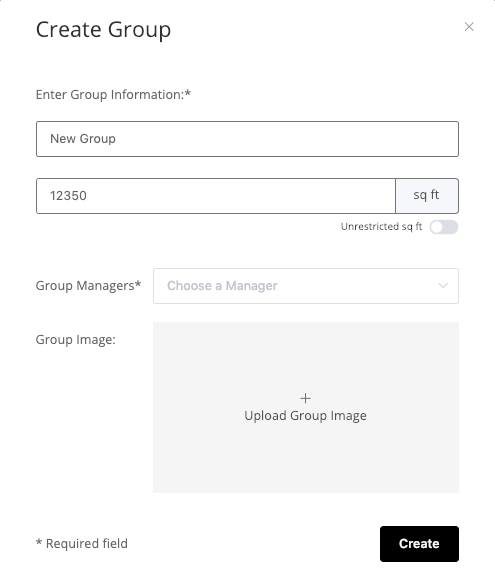 Quick adjustments regrading the assigned area and group image can be made in the Groups tile or list view. Use the left icon to adjust the square feet allowance, and the right icon to upload a new group image. When in the list view, also move your mouse over the Group you would like to edit. A button will appear on the right to adjust the assigned area, when you click on the small group image on the left you can upload a new group image. To rename a group click on the group's name at the top. You can add members to the group and change the assigned area on the top right. You can also read more about how to download a CSV file containing an overview of the group here.